I bought République through the Amazon Appstore, but it doesn’t work on my non-Amazon Android device. The version on the Amazon Appstore is specially designed to work on the Amazon Fire HDX and Fire Phone devices only. The Appstore will show you before you make a purchase which of your devices are compatible with the app and which are not. For all other Android devices, purchase the game through Google Play. I don’t have much space on my device, and République is a large game. You do not need all episodes on your device at the same time in order to play the whole game. You can juggle the data installed on your device. In order to play Episode 2, you need Episode 1 installed; to play Episode 3, you need Episodes 1 and 2 installed. For Episodes 4 and 5, you only need Episode 1 installed as the base application. If you need to shuffle data space, you can install Episodes 1 and 4 to play Episode 4. When you’re ready to play Episode 5, delete 4, and install Episode 5. The Google Play Store provides a 2-hour time period after a purchase to obtain an automatic refund. After the 2-hour time period, we are only able to give refunds for certain technical issues. My download stops at 95%. We have a few solutions for a 95% download. 1: Please only download one episode at a time. 2: At 95%, the downloads start to perform the installation operation, which takes about 10 minutes. Please be patient while the installation is in progress. 3: If you have already waited 10 minutes, you can delete your game cache and redownload the game. Open your device’s Settings app and navigate to Applications > République; then, select the “Clear cache” button. Selecting an episode returns me to the main menu. Try these three separate solutions. 1: Clear the cache. You can do this by opening your device’s Settings app, navigating to Applications > République, then selecting the “Clear cache” button. 2: Restart your device (turn it off then back on again, or select the “Restart” button after long-pressing the power button). 3: If neither of the above fix it, you may need to re-download the Episode. Unfortunately, the data occasionally gets corrupted and can result in the Episode not loading. Cooper isn’t narrating any of the cartridges anymore in Episode 3. Where did he go? Keep playing to find out! How do I get OMNI Level 1.0? Have Hope follow the objective marker. You can locate the objective marker on the map by entering OMNI View and clicking the Map icon at the bottom. If you do not see the objective marker, go to Settings, access the Gameplay tab, and turn the objective marker option ON. Solve the puzzle in the Headmaster’s Dining Room and go through the fireplace. OMNI 1.0 is in the room to Hope’s left. How do I get past the lasers in Episode 2 to reach the 3D printer? After Hope enters the room, activate OMNI View. You will see wrench icons in different colors. Each icon controls the laser that shares its color. Go into OMNI View when you first enter the room. Hack the green and yellow icons. The yellow icon will turn orange, and the green icon will turn light purple. The lasers in front of Hope and to her left will turn off. Turn the camera as far left as it will go. From that POV, jump to the camera on the other side of the wall. Bring Hope around the corner and to the base of your camera. Turn the camera as far left as it will go. Move Hope through the open cargo door and stop her before she touches the purple laser. Leave Hope there for now. Turn the camera as far right as it will go. Jump to the camera icon located to the left of the orange gear icon. Turn the camera as far right as it will go. Hack the light purple gear icon, and it will turn yellow. You will automatically exit OMNI View. Return to OMNI View and jump to the camera left of the yellow gear. Next, jump to the camera at the bottom of the stairs. Hack the blue gear icon, and it will turn dark purple. You will automatically exit OMNI View. Return to OMNI View and click the “Find Hope” button at the bottom of the screen. To the camera’s left, you will see a hallway next to a staircase. Send Hope through the door at the end of the hallway to find the 3D printer. I am stuck at a door that requires a thumbprint in Episode 1. What do I do? Return to the area marked “Investigation” on your map. The room has a looping shape. Jump to the cameras in the back find the Prizrak named Shell. In OMNI View, look for an orange square behind him. Interact with it to get the thumbprint. The square will then turn gray. Return to the door that requires the thumbprint. Enter OMNI View and interact with the thumbprint icon to unlock the door. I am stuck in the Barracks Confinement Cell in EP5. The unlocking mechanism in the Barracks Confinement Cell is tucked away. Here is how to find it. (1) Look through the camera in Hope’s cell and enter OMNI View. (2) Jump to the camera outside Hope’s cell to the right. The camera is next to a locker, and the locker will appear green in OMNI View. (4) Turn the camera all the way to the left and then dip it all the way down. You will see the unlocking mechanism. Interact with it, and you can continue Episode 5. I left an Atlantic confinement cell in Episode 3, and now I’m stuck back in Episode 1. What do I do? Congratulations! You found a backtracking shortcut! You exited an Atlantic confinement room in Episode 3 through a door that leads back to Episode 1. The door connects to the Headmaster’s Dining Room in Episode 1. Earlier, you took the elevator from Episode 2 to Episode 3, but the elevator is now disabled. You need to retrace your steps through the shortcut to return to Episode 3’s map. In the Episode 1 map, go to the Headmaster’s Dining Room next to the Kitchen in the Dorms. (You previously solved the painting puzzle here.) Send Hope through the crawlspace beneath the Headmaster’s painting. Go through the door opposite the room where you upgraded to OMNI 1. Here, you’ll find the Level 3 door back to the Atlantic confinement room. Walk through it, and find the other exit to the confinement room to continue Episode 3. In Episode 1, I’m stuck in a room with a fireplace and several paintings. What’s the secret? Enter OMNI View and interact with the green gear icons on the paintings. Hack the paintings until they all point toward the fireplace. Finally, hack the gear icon in the fireplace to solve the puzzle. My in-game phone battery is dead. How do I use the batteries I found or recharge otherwise? Your phone needs a charge to work. You can charge your phone two ways. 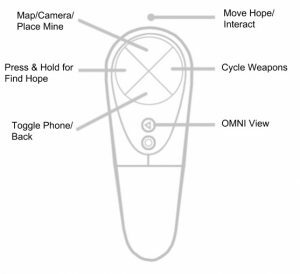 First, look for batteries in Hope’s environment. To use a battery, open Hope’s inventory and tap or click its icon. Second, each confinement room has a battery charging station inside. Find a nearby confinement room and look for the charger. Direct Hope to interact with the charging station to recharge your phone. Game Center notifications keep appearing, but they are not registering in Game Center. All problems with achievement notifications occur within the iOS Game Center. Apple manages the Game Center, and any trouble with the Game Center goes through them. I bought a season pass, but the game wants me to pay for my chapters again. If République prompts you to buy the game again, don’t worry: you will not actually be charged again, and the charge will not appear on your credit card. If the charge appears on your card, please let us know, and we’ll direct you to the right resource for a refund. I would like to request a refund. I’m getting a “Cannot connect to iTunes store” error. I’m having difficulty downloading and installing République from the App Store. First, have at least 1GB free on your device and make sure that you are connected to a good wifi network. The download will fail if it is interrupted at all, so try a stable connection at an internet cafe, public library, or other wireless source. Restart your device, then follow these steps. Update to the latest version of République via the App Store. At the République main menu, tap the Play icon. At the episode menu, tap on the down arrows on the episode you purchased. It may look like a shopping cart, but you’re still following the right steps to activate your purchased content without buying it again. République will offer a free download of your chosen episode. When unpacking completes, answer the phone call that starts the episode that you downloaded. If the game hangs for more than 1 minute on this screen before starting the game, tap the X button on the corner of the screen to delete the download. Re-download the episode. It should no longer hang. I’m trying to upgrade to OMNI Level 2.0, but the pyramid icon isn’t on the server. Unfortunately, you have experienced a very old bug. We have a couple of solutions for you. First, enable iCloud on your device. Then, upload your save games to iCloud. Once you have backed up your save, delete and reinstall the game. The game might appear to charge you twice, but you will not incur a second charge. Apple has many failsafes in place to prevent being double-charged in error. After reinstallation, restore your save file from iCloud and try interacting with the pyramid again. If the icon to upgrade to OMNI Level 2.0 still isn’t there, then the save file is unfortunately corrupted. You will need to delete the save and start over. iCloud isn’t syncing properly, and my saves are disappearing. Please make sure you have updated République to the most current version. Your missing save files should return. iCloud can also malfunction you create a new game in the same save slot that held your earlier save synced to iCloud. Otherwise, your old data will return to normal shortly. 1: Switch off République in your iCloud settings. Your local save files should reactivate. 2: When your local save files have reactivated, load them and play the game long enough to trigger an autosave. The autosave will create a save timestamp more recent than your iCloud save. Interact with a Data Broker terminal inside a Confinement Cell to trigger a save. You do not need to purchase anything from the Data Broker. Simply log out, and the game will save. 3: Turn iCloud back on. iCloud will overwrite the old back up with the most recent save. Turn on iCloud and make sure your République save files are stored on iCloud. Make sure you are updated to iOS 9 or greater. Go to Settings > iTunes Apps and Stores and then sign out. Sign back into iTunes and reinstall République. Download all the episodes you have purchased. You may have to restore your purchases within the République app. iOS Family share isn’t working. My download stops at 80%. République’s data completes transfer to your device at 80%. The game installs during the remaining 20%. If the download pauses at 80%, wait 10 minutes for the game to finish installing. My game crashes or lags. République will sometimes crash due to low memory on iOS devices. Try closing all other running apps and then restarting your device. This should increase performance and resolve your crash at the start of the game. If the game still crashes after these steps, please contact us at [email protected]. We will be glad to assist further. Please send us a crash log along with your email. You can send us your crash log by following the steps at http://www.chromium.org/developers/how-tos/retrieving-crash-reports-on-ios. The instructions will direct you to the crash logs for Chrome, but you can use the same method to retrieve the logs for the game on iOS. When the linked instructions direct you to “Chrome,” look for “République” instead. If those steps don’t work, try the method described at http://support.omnigroup.com/ios-console-log instead. Attach the crash logs to your reply, and we can review them. My game won’t restore purchases. Even after reinstalling, it doesn’t download past 0%. Contact Apple Support to verify a record of payment for the Season Pass. The App Store handles all transactions, even if the purchase itself happens within the game app. If the game is not restoring any purchases, they might be able to troubleshoot. If you verify purchase of the Season Pass, please contact us at [email protected]. We will be glad to take a closer look. My save isn’t working or is being deleted. Save errors most frequently relate to iCloud settings or jailbroken devices. First, check your iCloud settings. Go to the Settings app on your device. Select iCloud. Make sure your correct Apple ID is logged in. Select Documents & Data. In that submenu, make sure that République appears and is switched to the “on” position. Saves do not currently work on jailbroken devices. You must restore your device to regular iOS and remove any previous save file from iCloud. Delete and redownload the game to continue without errors. The Season Pass is priced as $.99 or free on iTunes. Why am I being charged for episodes? The Season Pass is the best deal. You get the complete game and save $8. We need two items to review the problem: a player log and a System Report. Be sure not to open the game again until you get the log and report. The log files are overwritten each time you open the game, thereby erasing the info that we need. You can, of course, open the game again after your crash. Just be sure to grab the log and report first. Open your finder and type Command+Shift+G. Hold down the option key, and click on the apple menu in the upper left corner. When the system information window pops up, go to File > Save. Save the file some place easy to find. I bought the game on iOS/Android. Can I have the PC/Mac version for free? République on the PC and Mac are unique versions of the game apart from the iOS and Android versions. They feature many enhancements designed specifically for the PC and Mac, and they are separate purchases. I would like a refund on my Steam purchase of the game. Steam handles refund requests for games bought through Steam directly. You can open a request at http://store.steampowered.com/steam_refunds. My game crashes on launch. Once you have finished, the link that previously launched République will now say “Install.” Click that link to complete the install process. Once République has reinstalled, launch the game. It should work now. If reinstalling République does not solve your problem, contact us at [email protected] with two files. First, we need a player log, sometimes referred to as an “output log.” Second, we need a DXDiag report from your PC. If the issue is graphical in nature (a character falls through the world, an object doesn’t appear on screen, etc), please provide a screenshot. Importantly, after a crash, please do not run the game again until you have obtained these files. République overwrites the relevant log files whenever the game starts, thereby erasing the information that we need. You won’t compromise anything important if you run the game after getting the records. Right-click République in the game library and scroll down to Properties. Click Properties to open a window with several tabs. Select the Local Files tab. Click the Browse Local Files button. A window outside Steam will open. Attach the Output_log.txt file to the email you send to our support system. From your desktop, press the Windows key and “r” simultaneously to open the Run window. Type “DXDIAG” into the Run window and click OK.
A window with several tabs will open. At the bottom of the window, click the button that reads “Save All Information.” This will save the data we need as a text file, and you can place it wherever is easiest for you to locate (such as your desktop). Attach the DxDiag.txt file to your support email. Once we have these, we can review the specifics of your problem. I bought a special version of République, and I don’t see Hope’s bonus costumes. Hope’s alternate costumes are available during limited periods, and they are not tied to specific copies such as the Contraband Edition or pre-orders. The outfits were available during the first two weeks following the PS4 version’s release, and they have been available intermittently since release. If you claimed the costumes once, you can download them later as long as you use the same Playstation Network ID. You can access them indefinitely, even if you remove local République data or reformat your PS4. I’m playing République using the Student Uniform (hard mode) on my PS4, and I can’t find enough video tapes to save my game. Here are the locations of all the save tapes in the game. Where do I change Hope’s costume? You can change Hope’s costume in the lockers near the end of the tutorial. The tutorial ends immediately before Hope enters the Atrium and overhears two Prizrak as they enter the Library. Be aware that, if you select the Student costume, you will not be able to change the costume again during the tutorial section. For all outfits, your costume will be set for the rest of the game after you exit the tutorial. Selecting an episode still returns me to the main menu. We have sought a common cause across the variety of devices, and we have a potential solution that should get the episodes running. We would love players whose devices don’t load episodes 2 through 5 to let us know their experiences with it at [email protected] The process is a bit technical, but hearing all users’ stories with the process will go a long way toward an automatic fix that works for everybody. 1: Run the game and load a saved game to get to the episode select screen. 2: Delete any episode data that can’t be loaded using the “X” in the upper right of that episode’s icon. 3: Begin downloading a single episode’s data again. Watch the percentage closely. 4: When the percentage says 95%, quickly kill the app, either through the app itself or by using the “recents” button. 5: Use your phone’s file-exploring app to find the zip file. Please only use the tools installed with your Android OS or Windows Explorer by connecting the device to your PC. We cannot guarantee the reliability or safety of third-party file-exploring programs. Each episode has a different file name, but we will use Episode 5’s name as an example. You can find the zip file here: Android/data/com.camouflaj.republique/files/Chapter5/Ep5-ETC-336071.zip. 6: Delete the partially unzipped Ep5-ETC-336071.obb. Leave the file Ep5-ETC-336071.txt alone. 7: Using the file-exploring app, manually unzip Ep5-ETC-336071.zip to the Chapter5 folder, or unzip it anywhere and move Ep5-ETC-336071.obb to the Chapter5 folder. 9: Run the game and load the saved game to get to the episode select screen. The episode will display the download button, but once you click download once it should detect the presence of the unzipped file and use that instead of redownloading. 10: Try to play the episode. You might need to tap on the icon a few times to get past the warning message about starting an episode in the middle of the game. In order to determine the cause of your crash, we will need information from your device. Please send an email to [email protected] with the following information. 1: The specific location you experience the crash. If possible, it would be great if you can get us the name of the camera as listed in Bio View at the bottom right corner of the screen. If this is not possible, the general area is fine. 4: Open Application Manager app, find République, and send the full Version name under the title “République”. This information will help us to investigate the issue and hopefully provide a fix. My RÉPUBLIQUE VR VR installation keeps failing! Make sure you have enough storage space (at least 3GB) to install RÉPUBLIQUE VR. If that doesn’t resolve the issue, please completely delete the app and re-download it. I press the “Find Hope” button but it isn’t showing me where she is! Try holding down the button (not tapping) to Find Hope. Do the new Hope costumes change the gameplay? The “Pre-Cal” costume is the default outfit and thus has no special modifiers. The “Student” costume is for fans of survival horror genre—enemies are more challenging, items are rarer, and saves are limited in quantity and no longer automatic. To save your game, find a videotape hidden in the world and then use it by interacting with any machine found in the prison cell-like Confinement Rooms located through the game. Each save uses up one videotape. Good luck! You’ll need it. The “Prizrak” (guard) costume causes enemies to ignore Hope—unless she is engaging in suspicious behavior—such as running,sneaking around, or colliding with enemies. This costume also grants Hope with unlimited Taser ammo. Choose this costume for the easiest and least stressful RÉPUBLIQUE VR experience. The “Runner” costume is for competitive players who enjoy a good speed run. Your total playtime is tracked and displayed on a smart watch. You can view the watch by raising your phone (press the “Back” button). Hope’s movement is set to “run” by default. Be careful not to get caught by enemies! My Gear VR/Oculus Go Controller keeps getting off-center. When you use the Gear VR or Oculus Go controller, you may notice that the orientation is a little off. Reorienting the controller resets the on-screen pointer to the default position, making everything right again. 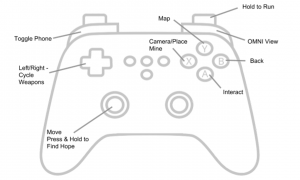 To reorient the controller, press and hold the Home button from any screen until the circle fills up. When the circle disappears, the controller is reoriented. How do I raise the phone? Press the back button on the controller. It is located under the touchpad. 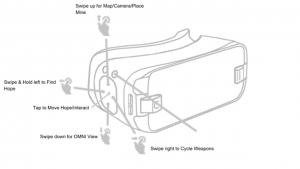 On the Gear VR, press the back button on the headset. It is located above the touchpad. When receiving phone calls, you can answer them by either pressing the back button or by clicking the answer phone icon on the small version of the phone that appears. How do I lower the phone? Press the back button again to lower the phone. You can also lower the phone by clicking outside of the phone area, or by pressing the OMNI View button. 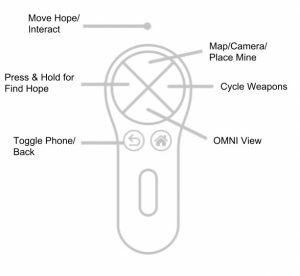 The OMNI View button is the bottom quadrant of the Gear VR/Oculus Go controller touchpad.